In the last month, my largest holding Altria experienced a large pull back after the FDA announced it wants to hear proposals to reduce nicotine contents in cigarettes. I wanted to add but my position in MO is already too large. I will add more to MO if it drops below $60. I am also watching PM. I would like to increase my stake in PM but I first want the stock to be in the low $100s. My portfolio has not grown for a while because of some of my positions pulling back from all time highs which I find healthy. Crossing $400,000 is proving to be very challenging. August, September, October usually are bad months for the stock market so perhaps I can have a good opportunity to add quality companies at discounted prices in the coming weeks. Colgate (CL) has pulled back but it's still very expensive for a no growth stock. I am considering adding a little. Kimberly Clark (KMB) pulled back a lot too and it is on my radar for adding. The drink companies (KO and PEP) are both doing well. I am a big fan of how PEP is turning out in terms of organic growth in the snack segments. On the cleaning side, Clorox (CLX) is performing very well organically. CHD has pulled back but it is still expensive. I am considering adding some CHD. Healthcare stocks have risen a lot and are all expensive. I wish to add more to JNJ and BDX and MDT and SYK if they were priced more reasonably. I may just add small amounts to dollar cost average since I want to expand my healthcare weighting in my portfolio. On the foods side, packaged foods companies stock prices are falling back. GIS is attractively valued and candidate for adding more for me. It has a nice +3% yield. I like MKC and SJM and HRL at these levels too, they yield less though. I will consider dripping small amounts into these 4 stocks. The mall is a disaster. I own quite a few shares of TJX and ROST. Both are pumping out spectacular earnings numbers but it doesn't matter. Everything that is related to the mall gets dragged down with all the other "bad" bricks and mortar names (i.e. Macys). In this market anything that is related to the mall gets their stock bulldozed by the company called Amazon. I find TJX and ROST to be good value here but am hesitant to add since these positions are speculative and they're already quite large for me. On the discretionary side, Home Depot crushed earnings but is experiencing some pull back because it's priced to perfection. I find this to be a good time to add. Mid 2% yield and double digit dividend growth is highly impressive. They also have a solid dividend track record even during the economic crisis of 2008 (they held the dividend flat). Starbucks is not performing so well but this looks like a good time for me to add. Am thinking about it. McDonalds is performing incredibly well but the valuation is way too high for me to even considering adding more. Overall I am very impressed with the Easterbrook's performance and what he was able to do with a broken company. I want to add more utilities but they're all so expensive. These stocks kept rising even when interest rates are rising (except SO which has to deal with the disaster that is the Vogtle nuclear project). My favorite is NEE and I may add more just to dollar cost average. On the financial side, I do not own any banks because I do not like the lending business. Too risky for me. I prefer middleman toll road type business which to me is Visa and MasterCard. Those two are performing spectacularly and I believe this is because of the overall trend towards a cashless society. Those two will profit heavily and I will continue investing and adding to those two companies. On the industrials side, ITW is pulling back and this makes it interesting to add. The recent dividend increase of 20% was huge for a dividend aristocrat yielding about 2.2%. 3M (MMM) hasn't really pulled back but I am considering dollar cost averaging my position. I am looking for a third industrial to add and I have been eyeing General Dynamics (GD). It has risen a lot but it is still (valuation wise) cheaper than many of the consumer staples I invest in. On the REIT side, I am considering adding more to FRT. Realty Income (O) is a large position for me already and I want to add more to a second REIT. I receive 100 free trades every month. I receive free trades from Bank of America because my portfolio size is high enough to qualify for certain benefits. I usually buy very small amounts across multiple stocks. I will post what I buy in a few weeks. 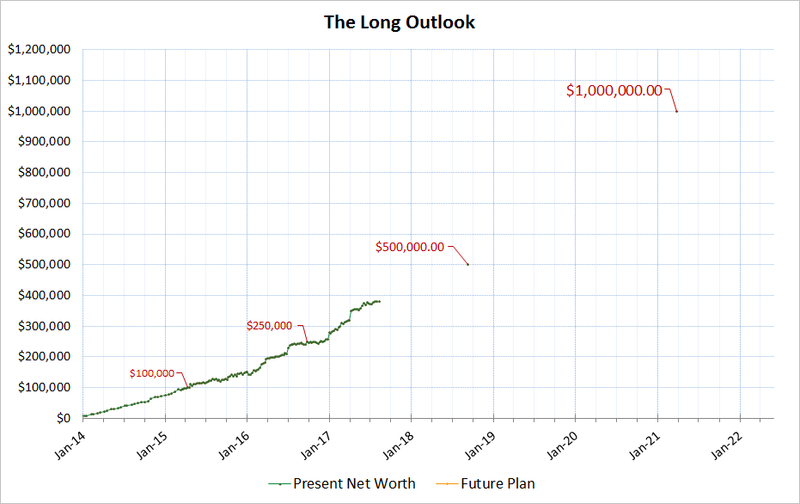 The graph above shows the annual dividends my portfolio can generate. I am almost passing $10,000 in annual dividends. I think I can achieve that in a few weeks. My ultimate goal is to use these dividends to fund my daily expenditures. That way I won't have to rely on my job for income to survive. My daily needs will eventually be covered by passive income. I also expect this passive income to grow by itself without any contribution from my part. 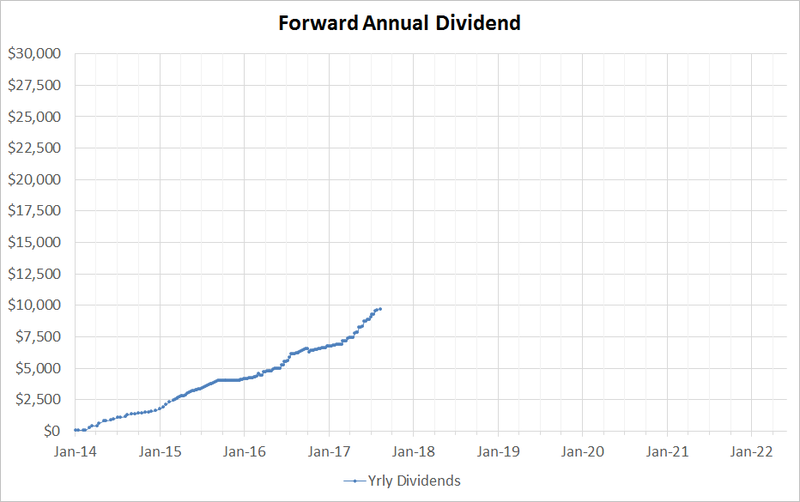 I expect the dividend to grow by itself around 7-8% a year at a yield of 2-3% (this equates to an income growth of 10% if dividends are reinvested). 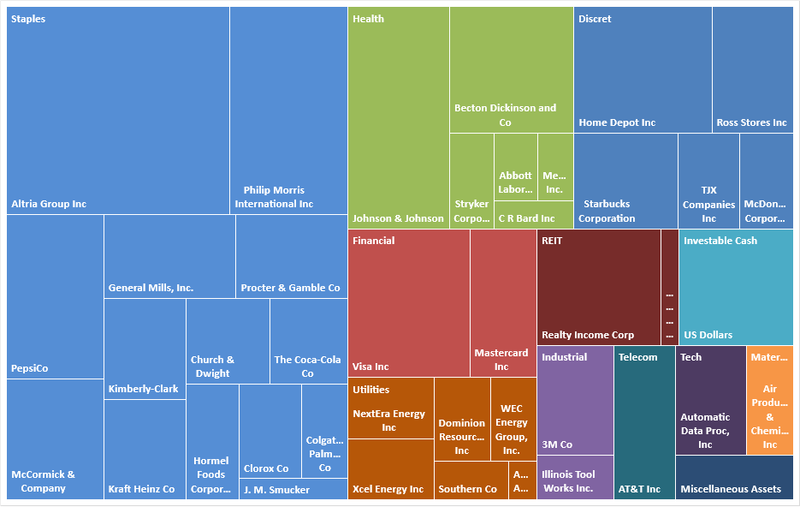 The treemap and sector map above shows how my portfolio if weighted right now. Although Altria (MO) is a large position, it is not as large as it used to be. Eventually I will have many positions in the 5 figure category and Altria will just be one in a large dozen of heavily weighted companies in my portfolio. I emphasize dividend stability and predictability in my investment portfolio. Hence my heavy weighting in Consumer Stsaples, Utilities, and Healthcare companies. Most of my positions are what I would consider "Core" meaning I will likely hold them for for a very long time. The only positions I would consider trading are supporting and speculative positions which are a small part of my portfolio. When the economy has a recession and business looks dire, I will be comfortable holding onto my core positions but not necessarily the speculative positions. As an example, a core position would be Pepsi or Johnson and Johsnon; a speculative position would be Ross Stores. Hi, how did you make those chart I like them.